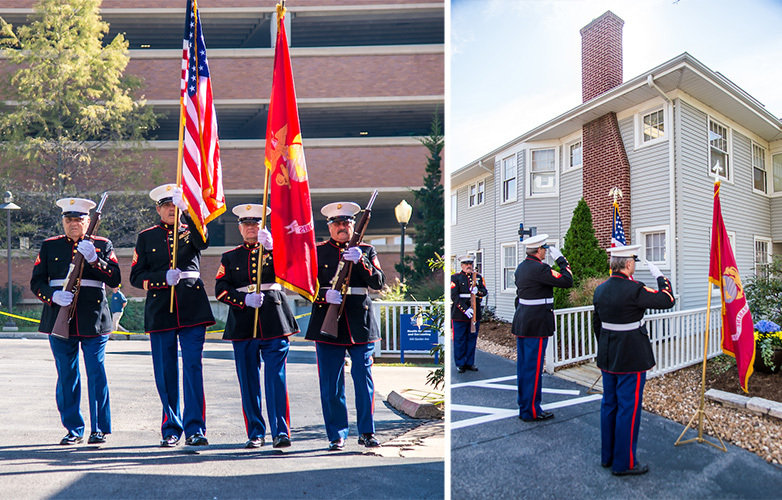 Members of the color guard from the Marine Corps League Detachment 183, South St. Louis, posted and retired the colors at the beginning and close of the dedication ceremony. Family members and friends of the late Tom Palozola turned out in force, along with members of the Webster community, for the dedication ceremony for the Cpl. Thomas Palozola Veterans Center on Oct. 20 at the Webster University home campus. Nearly 100 guests witnessed President Elizabeth (Beth) J. Stroble and Provost Julian Schuster speak of Palozola's accomplishments and honor him with a proclamation presented to his immediate family. The Cpl. Thomas Palozola Veterans Center is accessible to all student veterans on the home campus to socialize or simply unwind between classes. Members of the Student Veterans Organization (SVO) also hold regular meetings there. KSDK (Channel 5) ran a story Thursday night announcing the ceremony and the renaming of the center. ABC News (Channel 30) covered the event and broadcast it twice during its Friday evening newscasts. KMOV (Channel 4) covered the event and ran the story during their Friday evening newscasts. St. Louis Post-Dispatch ran a photo and a short story about the event on their website Friday night and in Saturday’s paper. St. Louis Public Radio also was at the dedication ceremony, and aired interviews with Matt Palozola and Christopher Fuller on Friday evening. They also plan to broadcast more on this event as part of a larger story as a Veterans Day feature in November. Dedication of the The Cpl. Thomas Palozola Veterans Center on Oct. 20 at the Webster University home campus. The ceremony began with the posting of the colors by the Marine Corps League Detachment 183, South St. Louis color guard. Christopher Fuller, current president of the Student Veterans Organization (SVO), then welcomed attendees and spoke of the importance of carrying on Palozola's vision. 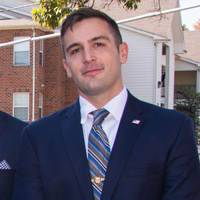 "We promise, as members of the Student Veterans Organization to advance Tom’s vision, continue to reach out to Student Veterans, to provide a safe and comfortable space to share common experiences and to engage with the broader University student body for the betterment of Veterans, the University and local community," said Fuller. Top: President Stroble presented a proclamation to the family, in recognition of Palozola’s selfless work for fellow veterans. Bottom left: SVO president Christopher Fuller welcomed attendees to the ceremony. Bottom right: The lounge area inside the Veterans Center, with the wood plaque above the mantle. 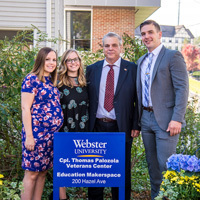 Stroble presented a proclamation to Palozola’s father, Tom Sr., and siblings Matt, Libby and Maggie, recognizing Palozola’s selfless work for fellow veterans both at Webster University and through his work for the Veterans Administration. 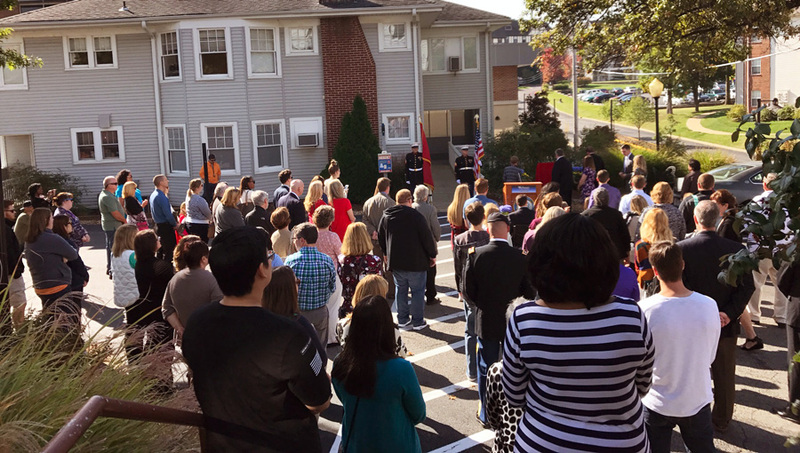 Reflecting on the opening of the Veterans Center in October 2015, Stroble said, "It is a real honor to be able to speak at this dedication ceremony to pay tribute to Corporal Tom Palozola. I remember Provost Schuster and I stood right here—at this very spot—just two years ago with Tom, on a sunny October day just like this, for the ceremonial ribbon cutting to open the Veterans Center. That day and every day that followed in this space was made possible by his work." The Zola Initiative, founded in Tom's honor, is a nonprofit organization that aims to enhance veterans outreach programs in communities and colleges across the country. Palazola's friends and former SVO members had a carved wood plaque commissioned, specifically for the dedication ceremony. The plaque was installed over the mantle at the Veterans Center. Matt Palozola, who is also a Marine veteran, spoke on behalf of the Palozola family, and thanked the University for honoring his brother's efforts to create a place on campus for student veterans, and for holding the dedication ceremony. He also shared his sentiments on why his brother worked to establish the Veterans Center in 2015. Click here to view more photos of the dedication ceremony at the University's Facebook page. Following the ceremony, current SVO members hosted 'Q on the Quad, a free BBQ lunch for students, catered by Kenrick’s Meats at the Quad on the home campus, where they served nearly 300 guests. Click here to view photos of the event on the SVO Facebook page. Palozola had completed a bachelor's degree in Management in December 2015, and was continuing his graduate studies at the time of his death in May 2017. He was a leader on the home campus in Webster Groves, serving as president of the SVO for 2015-2016. 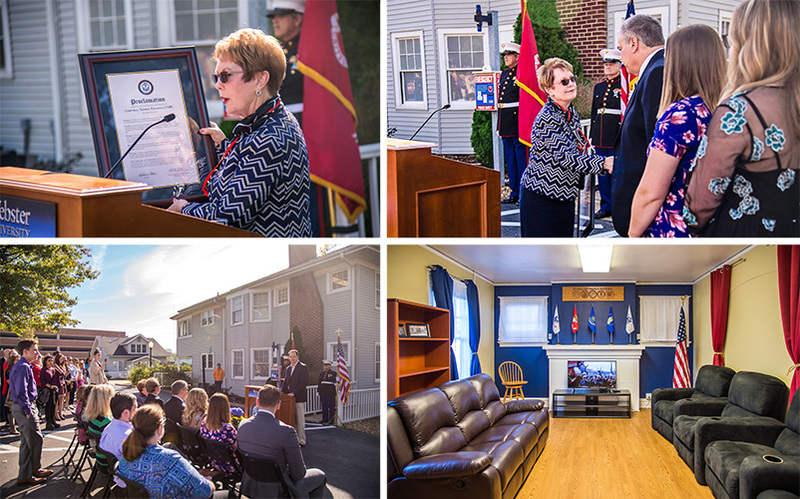 As SVO president, Palozola led the effort to secure the grant for the on-campus Veterans Resource Center in June 2015 [Webster SVO Awarded $9,000 Vet Center Initiative Grant] and spoke at the opening of the Center in October 2015. Before his time as a Webster student, Palozola had served multiple tours as a U.S. Marine, serving in Iraq and Afghanistan. Following his death, his brother Matt—who is also a Marine—established The Zola Initiative as a way of continuing Tom’s legacy and his mission of helping veterans have an easier life after exiting the service. The nonprofit organization aims to enhance veterans outreach programs in communities and colleges across the country.